Weymouth’s fine Georgian seafront is an impressive backdrop to the long arc of fine, golden sand. The views from the bay are spectacular, stretching across the horizon taking in the World Heritage Jurassic Coastline. 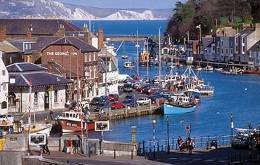 Weymouth's beautiful safe, sandy beaches, rich heritage and spectacular coastline make it a firm favourite holiday destination. area bursting with spacious modern shops and occasional street performances. Museum. An ideal place for a cream tea. Friday: After breakfast we leave Weymouth and begin our journey home. The 3 star Hotel Rex is situated on the Esplanade overlooking Weymouth Beach and the Jurassic Coastline beyond. All bedrooms are en suite and have TV, telephone, hairdryer and hospitality tray. The hotel has Wi-Fi and a lift, but some steps at the entrance.